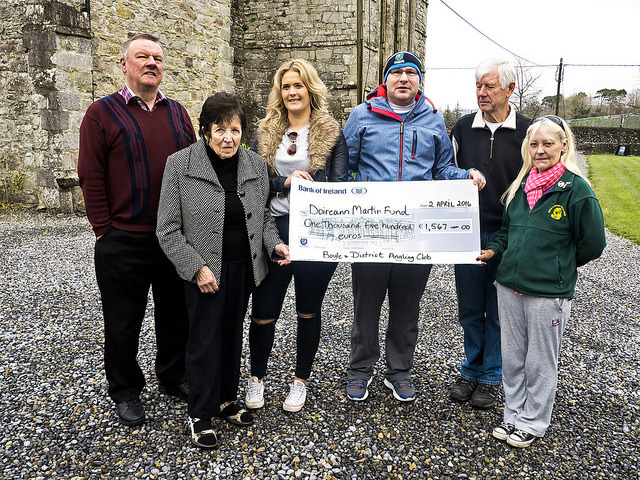 Many thanks for your kind donations to the Doireann Martin Fund.Cheque for 1,567 Euros presented to Doireanns family today. All the Winners listed below. In Third place is Shane Hayden, No 338 with a fish weighing in at 2lb 11oz. Shane gets €50. In Second place is Danny Funke, No 401 with a fish weighing in at 7lb 6oz. Danny gets €100. In First Place is Jack Darby, No 315 with a fish weighing in at 9lb 12oz.- Jack gets €200. In First Place with a piece of Crystal sponsored by Moonstone Jewellers, with a fish weighing 12lbs, Number 324, Danielle Hughes. The €125 Winner is No 299 Jason Monaghan with a fish weighing 18lb 8oz. The €250 Winner is No 363 Michael Hughes with a fish weighing 19lb. And the €500 winner for Saturday is No 308 Fidelma Fallon with a fish weighing 19lb 4oz. The €125 Winner is No 307, Ollie Fallon with a fish weighing 15lb 8oz. The €250 Winner is No 292 James Hurle with a fish weighing 18lbs 5oz. And the €500 winner for Sunday is No 421 Mark McCourt with a fish weighing 19lb 5oz. And in first place with a cheque for €2,500 and The Moonstone Jewellers Perpetual Trophy and The Winners Jacket is, with a fish weighing 24lb even weighed at Bullock Island on Saturday is number No 381 Vincent Smith.